FSSAI Recruitment 2019, Apply Online for 275 Technical Officers, Food Safety Officers, PA, AO & Various Job Vacancies @ www.fssai.gov.in : Food Safety and Standards Authority of India (FSSAI) has released the recruitment official notification for 275 vacancies of Technical Officer, Personal Asst. FSSAI. 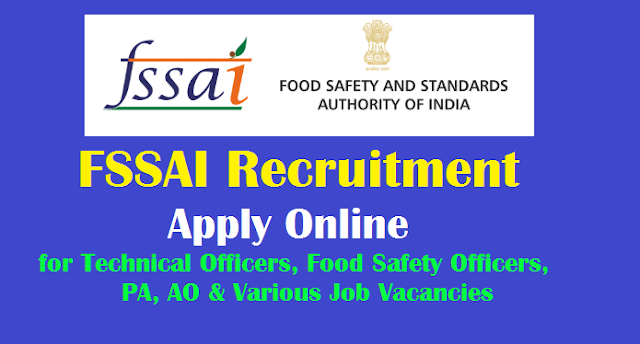 Food Safety and Standards Authority of India, Assistant, AO, PA & Various Posts Total 275 Job Vacancies and Apply Online Application Form Last Date 25th April 2019 @ FSSAI official website. FSSAI recruitment 275 vacancies of Assistant Director, Technical Officer, Central Food Safety Officer, Administrative Officer, Assistant, Junior Assistant Grade-I, Hindi Translator, Personal Assistant and Various. Candidates should have completed prescribed educational qualification and age limitations. FSSAI selection process will be made on through CBT, Written test and interview. Selected persons shall be posted at any where in India. Make the fee payment via online mode only. The applying online link will be available from 26th March 2019. Other mode of application will be rejected. For more information about Food Safety and Standards Authority of India (FSSAI) Recruitment 2019, candidates may check the official website @ www.fssai.gov.in. Food Safety and Standards Authority of India (FSSAI), hereinafter referred to as 'Food Authority’ is a statutory Body under M/o Health and Family Welfare. FSSAI has been created for laying down science based standards for articles of food and to regulate their manufacture, storage, distribution, sale and import to ensure availability of safe and wholesome food for human consumption to 130 crore citizens of the country. For further strengthening its core competencies, FSSAI invites applications on direct recruitment basis from dynamic, proficient and motivated candidates looking for exciting career opportunities in Food Regulatory System and wanted to be a part of our growth journey. Interested and eligible candidates can apply for the vacancies ONLINE, through website www.fssai.gov.in. Who are Interested and Eligible candidates visit the official site and read the notification to know your eligibility criteria and recruitment process. The final date for the submission of an online application will get ends by 25-04-2019.Candidates should have completed prescribed educational qualification and age limitations. FSSAI selection process will be made on through CBT, Written test and interview. Selected persons shall be posted at anywhere in India. Make the fee payment via online mode only. Step 2 : Click on the career section. Step 3 : Look around for “FSSAI Recruitment 2019 for Technical Officer, Personal Asst Posts“. Step 5 : Pay the application fee. Step 6 :Click on the submit button for final submission. Step 7 : Save and take print out for future use. Tags: Food Safety and Standards Authority of India (FSSAI) Recruitment 2019 Apply Online for 275 Technical Officers, Food Safety Officers PA, AO & Various Job Vacancies Job Vacancies Apply Online Application, Selection Process and more details available at fssai.gov.in.